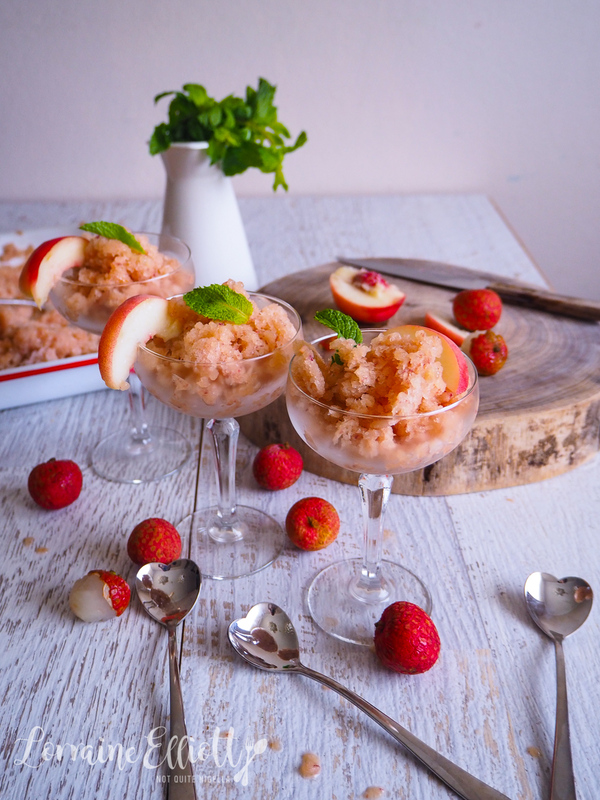 Quick, before stone fruit season ends, give this super easy bellini granita a try! 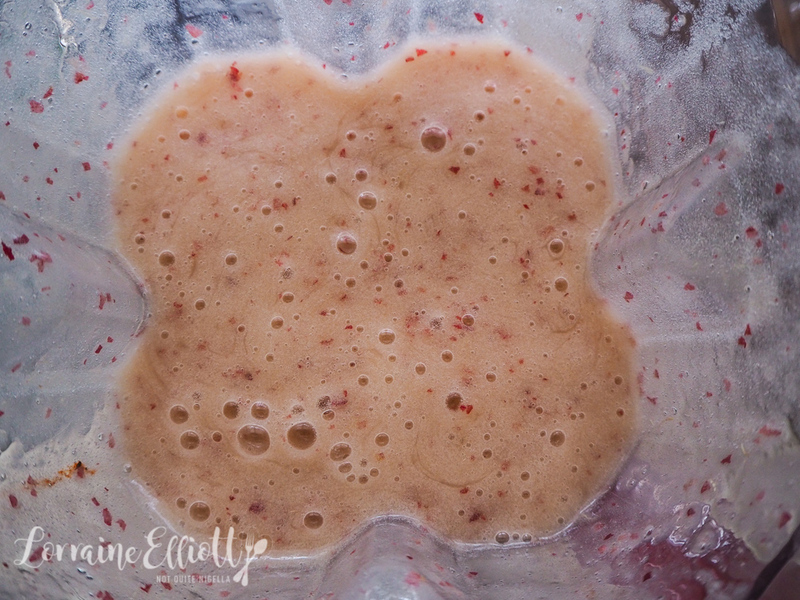 Nothing could be easier-you basically blend and freeze everything and then chip away. What you end up with is the unmistakable, aromatic and delicate flavour of a white peach bellini with some serious cooling down effects. 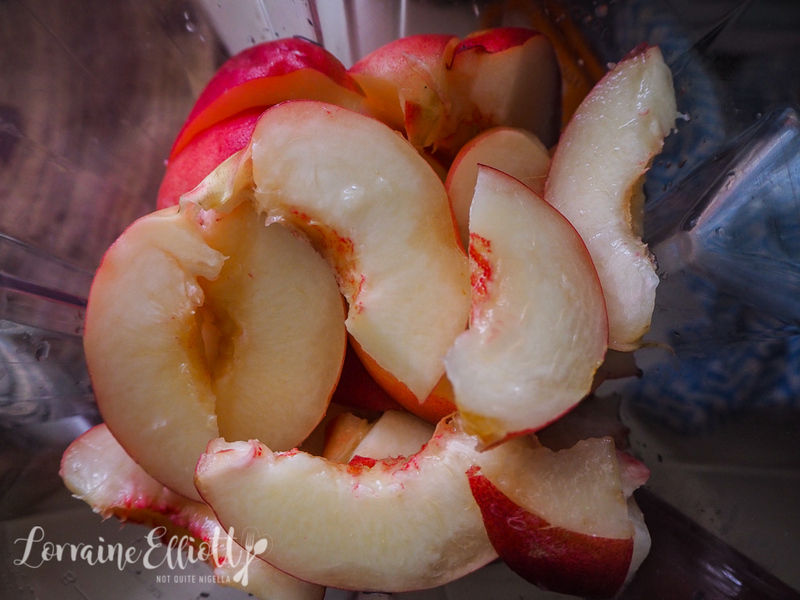 Perfect for entertaining or just if you want to make the most of peach season! During summer, I tend to order drinks like spritzes or bellinis. They're lightly sparkling so a bit fun and remind me of summers in Italy. And when I had overbought some white peaches and there was a series of stinking hot days and nights, all I could think about was granita. Granita is simple. It's basically sugar, water and flavouring that you freeze and then break up with a fork. It's also one of the tastiest ways to cool down. 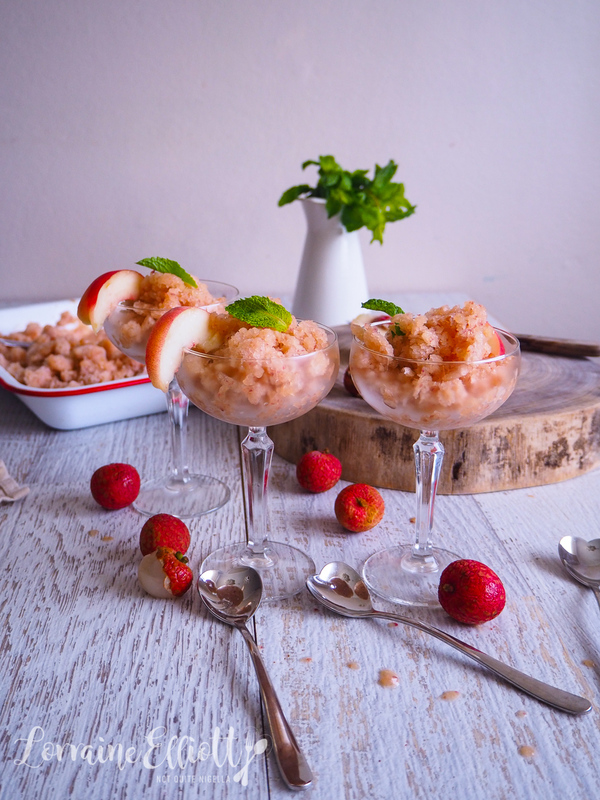 I decided to try making a bellini granita with the white peaches that needed using up. And I was not prepared for how good it was! This tastes exactly like a bellini because well, quite frankly it is a bellini, just frozen! I was having a bit of a day when I made this. We were expected to meet friends and I wanted to take pictures of this before we left for dinner. I took the photos and just needed to change clothes. I then asked Mr NQN if he could clean my set up on the dining room table and put the glasses in the sink and put everything away. Mr NQN has many good qualities: he's laid back and easy going and I plan everything and he is happy to come along for the ride. But on the other hand, he does seem unable to complete tasks unless they're specifically detailed. Take this granita. When we got home from dinner I walked in and saw the tray of granita still on the dining room table. Except it was a soupy mess as he had left it on the table in the heat. "Um what happened to the granita?" I said aghast. Not only had it browned slightly, I had also used champagne over prosecco because that was what was open and I was imagining that this had spoiled terribly in the heat and humidity. "You didn't tell me to put the granita away," he said. I think that is when I think my head exploded. "What? What? What?" is all I could say shaking my head. 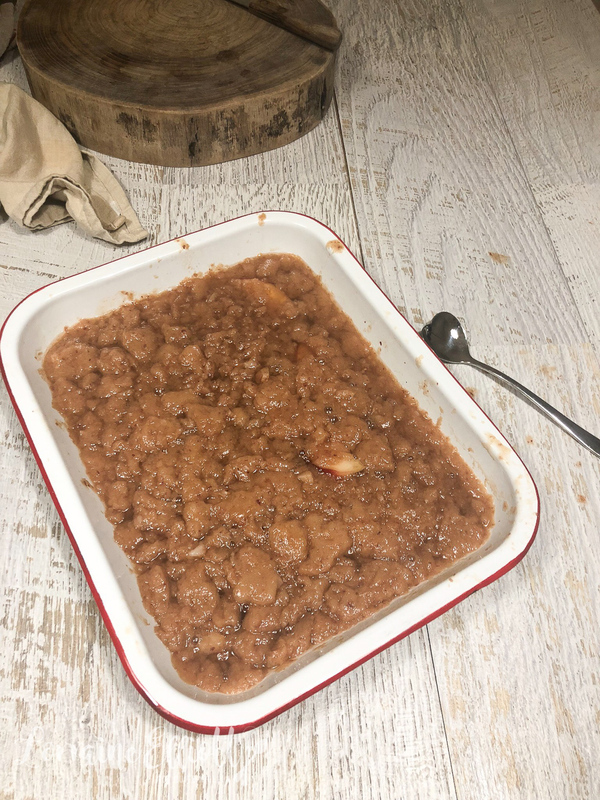 I saw the glasses in the sink, I saw the other bits and pieces that he had put away but I really wondered why he thought that the frozen granita would be ok melting in the 36C/96.8F heat all night long. "What were you thinking?" to which he just replied, "You didn't specifically mention the granita." Well one good thing came out of it. I learnt that melted soupy granita can be resurrected without any huge problems. I just shoved it back in the freezer and it froze again and it was still good. So tell me Dear Reader, do you have to give specific instructions to your partner or family? Do you want specific instructions or can you pretty much guess what is needed in a situation? Do you like bellinis? Step 1 - Roughly chop the peaches and then blend with the two sugars and Prosecco until smooth. Place in a large freezerproof tray and allow to freeze. Break up with forks and serve straight away. I served these with fresh lychees and mint. I have also been known to sneak a scoop of vanilla ice cream into this when serving it. It goes perfectly with the granita! recipeCool Down With These Raspberry Daiquiri Popsicle Cocktails! recipeFour Ice Cream Sandwiches For The Summer Festive Season! recipe Four Ice Cream Sandwiches For The Summer Festive Season!